Elastic Block Storage (available in AMS1, EWR1, NRT1, & SJC1) is a multi-tenant storage service. Packet's Block Storage service looks and smells a lot like Amazon’s EBS. You can create volumes of different performance profiles, leverage snapshot policies and more - all via our API or portal. The service is highly redundant. Comparing our block storage service to similar offerings at other clouds, an important difference is that at Packet you don’t have the benefit of a platform-managed hypervisor layer (we only offer bare metal compute and never leave an agent or any other tools/software on your server after it is deployed). As such, there is a bit more you should know about how to troubleshoot or deal with any issues that may arise. Check out the tips below. Standard Tier ($0.000104/GB per hour) - With 500 IOPS per volume this is good for backups, dev/test, and medium use datasets. Premium Tier ($0.000223/GB per hour) - With 15,000 IOPS per volume this is targeted at higher I/O heavy workloads. While our Block Storage product is the perfect match for a wide variety of use cases, the first and most important step is to understand when *not* to use block storage at Packet. As a general rule of thumb, databases are not a good fit for our Block Storage, especially those that are not resilient due to minor hiccups. While uncommon, even a small loss of connectivity to some databases can cause major issues. Various local disk options (SSD's and NVMe Flash) on each server config. The s1.large storage-focused server includes 24 TB of SATA w/ SSD's for cache. To create a new volume, click on the 'Deploy Storage Volume' button. On the following screen, give the volume a description, choose the size of the volume in GB, and select the location, then performance tier. If you'd like to set up automated snapshots, you can do so via the optional snapshot settings button. What are snapshots and how do they work? A snapshot is a differential copy of your volume made at a specific moment in time. If you have a 500GB volume, but only 250 GB of data on it, your snapshot is only 250 GB. With a snapshots, you are only billed for the changes to the original block device from the time the snapshot is made — as such, a policy of 5 snapshots may end up being only a small amount of storage if your rate of change on the device is low. Billing for all snapshots is at our lower $0.07/GB per month tier. After your volume is created, you need to route it to the server you would like to mount it on. 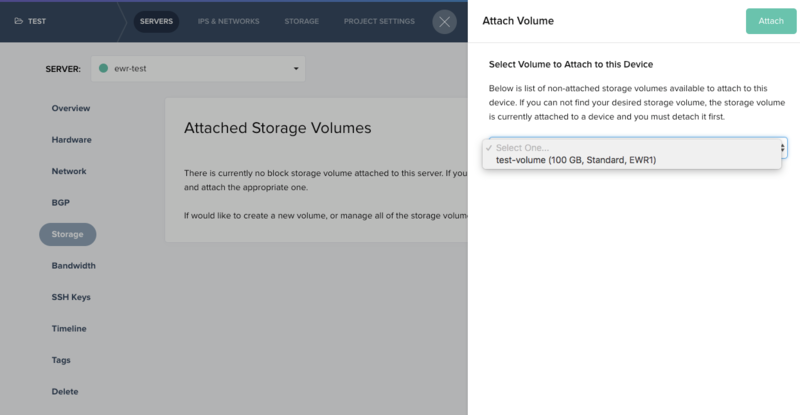 To do so, go to the server detail page that you'd like to connect the block device to and click on the Storage submenu on the left. Select your volume from the drop-down box and click 'Attach'. This routes the volume to your block device and allows you to mount it from your local server via iSCSI. As Packet does not have an agent running on any client-server or remote access to client machines, you need to run the final attach of the iSCSI volume to your server on your own. Packet provides a block storage management script to make this process easy. You can access the attach script via Github here. The option -m queue is very important, if block storage becomes inaccessible, this directive will keep the IO in-memory buffer until it becomes accessible. /dev/mapper/volume-32829074-part1: UUID="20e0931a-255b-4bf7-8e22-5da91198279f" TYPE="ext4" PARTLABEL="Linux filesystem" PARTUUID="0f9151b7-d2a3-45e4-97ed-ba2c7462ed4b"
Our Block Storage service looks and smells a lot like Amazon’s EBS. One important difference is that when you connect a block storage volume on Packet to a server on Packet, you don’t have the benefit of a hypervisor layer. As such, there is a bit more you should know about how to troubleshoot or deal with any issues that may arise. Each installation of our Block Storage product is made up of three physical servers, each with redundant network and power. In order to support data redundancy, each volume you create is replicated twice on the storage cluster. Using the -m queue option when attaching a volume is recommended since, during instances of very brief network blips, the server will keep IO in a memory buffer until the volume is reachable again. This greatly enhances resiliency and will prevent the volume from going into read-only mode. Although we do our best to prevent downtime, it would be a lie to say that network attached anything will have a 100% uptime, forever. There will be cases when a volume will go into read-only mode, such as if there is a longer network interruption, or there are issues with the storage cluster itself (volumes go read-only in order to protect any information that is there against possible corruption). The Verbose option will show any possible issues during the attach process. If the attach command is not successful, or if it shows any problems, please contact us.